From over 150 participants, 16 presented prototype applications, and a jury, awarded four awards amounting 12,000 Euros and a special award of a trip to Mobile World Congress in Barcelona. The award ceremony capped the first successful App CampKosovo, an event organized during the first weekend of November 2012. Aiming to advance and create mobile applications that can directly promote the Republic of Kosova, AppCamp Kosovo brought together innovators, application developers, designers and entrepreneurs and challenged them in a competition for building Best Kosovo App (Apple and Android) in four categories: News and information from Kosovo; Culture, Heritage, Traditions; Presenting Kosovo tourism and economy; and Entertainment game app about Kosovo. Organized by IPKO Foundation, supported by Ministry of Foreign Affairs of the Republic of Kosovo, British Council, Royal Norwegian Embassy in Kosovo, and Innovation Centre Kosovo this event was estimated to be the best one of its kind that took place in Kosovo. 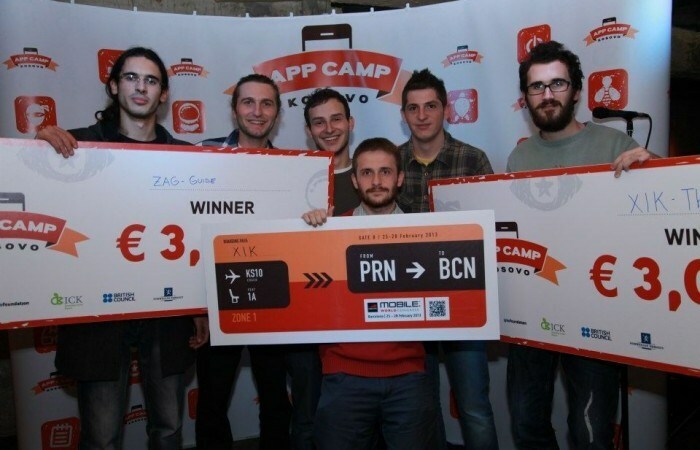 Aspiring to create better visibility of Kosova in mobile industry and to encourage people to create and build applications about the country, App Camp Kosovo awarded four best teams and sent the best one to Mobile World Congress 2013 in Barcelona. More than 200 participants expressed an interest and submitted their applications online to participate in AppCamp Kosovo through the AppCamp website. In total 120 participants attended the event. Prior to the event a special edition of BarCamp Prishtina was held to encourage participants to meet with each other during SpeedGeeking, a type of rapid match making event. During the pre-event developers, designers and marketing participants managed to find their peers and several teams were formed. On the first night of the event 120 participants formed 18 teams and pitched 20+ ideas while 16 teams decided to enter the AppCamp Kosovo race and continue to work during the event. During the event participants met with mentors, application experts coming from high growth mobile companies as well those supporting the global expansion of innovative apps coming from Kosovo to the wider international mobile ecosystem, including companies such as Google, Vodafone and Poken. In each category the best mobile application winners received 3000 Euros. After competitive presentations team XIIIK was selected as the team with the best app (The Highland Lute) of AppCamp Kosovo in addition to prize money they will attend Mobile World Congress 2013, which will be held in 25-28 February, 2013 in Barcelona, Spain. Other winners are: Graphsix (Skenderman game), ZAG (Kosovo Guide), Braqat (Prishtina Street Style). Following the close competition the professional jury decided to award two runner-ups teams with 500 Euro each to further develop their applications. Those teams are: ZAG (Plis) and Avengers (Kosovo Guide). AppCampKosovo was official partner event of Prishtina Startup Weekend where the second placed team got qualified to present and participate directly to the finals of Global Startup Battle, the world’s largest Startup Competition.